Despite the rich autumnal tones on tap, jewelry innovation seems to be taking on the bold green hues of summer. These exotic leaf and pod accessories, created by Bulgarian textile artist Ceca Georgieva, are fit for a woodland nymph. After more than a year of email exchanges, I was treated to her latest green jewelry experiments, a fresh discovery in a land more accustomed to Thracian gold ornaments and ancient leafy crowns. Georgieva is a Bulgarian national treasure who works pretty much on her own to promote environmental art and green design. We have been in dialogue about exciting new ways to bring awareness to green initiatives in her homeland (where I now spend a portion of my year), as well as the European art scene at large. 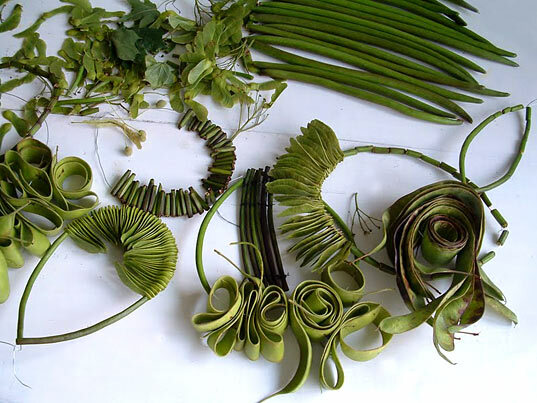 Georgieva magically assembled her pieces from fresh leaves, grasses, and pods gathered from Sofia’s Mount Vitosha. Her work previously entailed figurative sculpture crafted out of biodegradable materials like dried burdock, native vegetation, and even packed snow orbs. A soft-spoken but incredibly persistent person, she gave me a tiny red oak to plant upon my arrival in Sofia last May—a sign of friendship and loyalty for years to come. 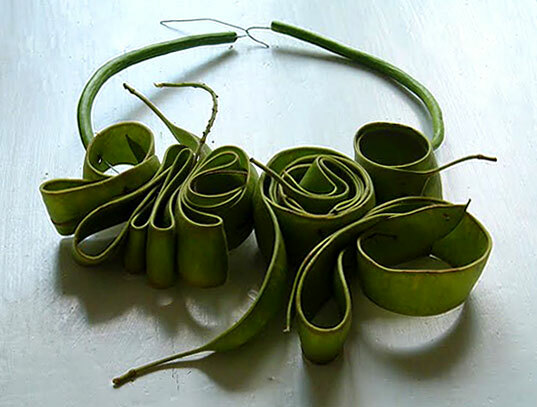 I love these pure and simple pieces that Georgieva has magically assembled out of fresh leaves, grasses, and pods gathered near her studio at the base of Sofia’s Mount Vitosha. They speak to the essence of green accessorizing in a way that highlights the jewels that exist in our immediate sphere. In a country that is forging a new path in global design and fashion, it is exciting to see artists and designers launch into bold ideas and concepts inspired by the simplicity of nature.